I’m a huge dog lover so I was filled with all kinds of emotions while reading this book. I know how painful it is to lose a dog. Some parts of the book were deeply sad while others were filled with wonderful memories. I loved Maggie. Even though she was a pet bereavement counselor, she was dealing with her own issues. I loved the relationships she had with her patients and the way she struggled to free herself of her own phobia so she could help one of them try to find her lost dog. The story is full of heartache, compassion, humor and most of all the love we feel for our dogs and the enormous loss we feel when they die. There was also a little bit of romance. As for the ending, I loved it. I loved this book and hope to read more from this author. 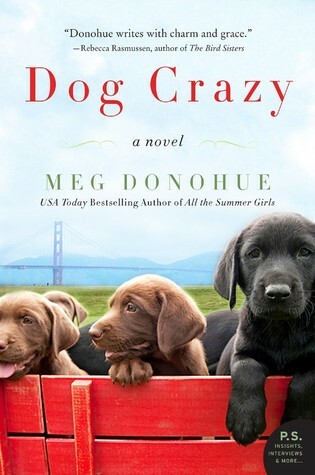 Meg Donohue is the USA Today bestselling author of DOG CRAZY, ALL THE SUMMER GIRLS, and HOW TO EAT A CUPCAKE. She has an MFA from Columbia University and a BA from Dartmouth College. 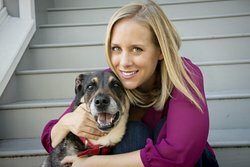 Born and raised in Philadelphia, she now lives in San Francisco with her husband, three young daughters, and dog, and is working on her next novel. Is there really such a thing as a pet bereavement counselors? This book sounds good to me. I love the cover! Yes Kathy, there are pet bereavement counselors. I can’t imagine a life without dogs. The longest I’ve gone is a year without a dog, and that was a very sad year indeed. I can’t imagine a life without a dog either. Mine is my baby. We had to say goodbye to our 15 year old dog a year ago so I understand the need for pet bereavement counselors. I’ve wondered about this novel so I’m glad to see you loved it, Vicki. I’ll add it to my list. So sorry about your dog. My dog is 15 and I don’t want to think about it. She’s my baby. My son is a cat person, and while I do like cats, I’m a lifetime dog lover. This book sounds fabulous. I love dogs, too, and their power to help us be strong when we feel weak. We lost our Henry this Fall, the most pathetic looking rescue dog you ever saw, but I am reminded of how much we loved him by your review. So sorry about your dog. I know how devastating it is to lose your pet. Although I have cats now, I grew up with dogs. Losing any of my dogs or cats has been traumatic for me. Losing any pet is really heartbreaking.